Two Chicks On Books: Blog Tour- DOVE ARISING by Karen Bao an Interview and a Giveaway! Blog Tour- DOVE ARISING by Karen Bao an Interview and a Giveaway! Hey y'all! I'm thrilled to have Karen Bao, author of DOVE ARISING here today with an interview! Check it out! Haven't heard of DOVE ARISING? Check it out! Phaet Theta has lived her whole life in a colony on the Moon. She’s barely spoken since her father died in an accident nine years ago. She cultivates the plants in Greenhouse 22, lets her best friend talk for her, and stays off the government’s radar. Then her mother is arrested. The only way to save her younger siblings from the degrading Shelter is by enlisting in the Militia, the faceless army that polices the Lunar bases and protects them from attacks by desperate Earth-dwellers. Training is brutal, but it’s where Phaet forms an uneasy but meaningful alliance with the preternaturally accomplished Wes, a fellow outsider. Suspenseful, intelligent, and hauntingly prescient, Dove Arising stands on the shoulders of our greatest tales of the future to tell a story that is all too relevant today. Hi Karen! First I want to say welcome to Two Chicks on Books! DOVE ARISING is one of my highly anticipated reads of 2015 and I’m so happy that you could stop by for a visit! For the readers: can you tell us a little bit about DOVE ARISING and the characters? 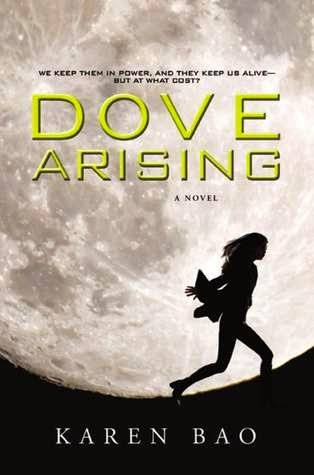 Dove Arising is about Phaet, a fifteen-year-old introvert living on the moon in 2347. When her mother is “quarantined” for “medical illness,” she joins the Lunar Militia to save her younger siblings from destitution. She races spaceships, allies with a shy and talented fellow trainee, and faces enemies more powerful than she could’ve imagined. Hope that makes it sound interesting! I know this is a series so do we have a title for the second book yet? Yes, I’ve painstakingly come up with a title for the second book – and the third. When Penguin and I are ready, we’ll share them with everyone. Yeah, and they sure know it. Cygnus, Phaet’s computer whiz brother, resembles my computer whiz brother. Larry gave me a lot of tips for the scenes when Cygnus cracks secure networks and stuff. Also, Phaet’s quiet tendencies were inspired by one of my best friends, who doesn’t talk much but is a lot tougher than she seems from the outside. The same friend also inspired some of Wes’ cutesy tics, like biting things with the side of his mouth. In short, if you’re friends with me, you might find bits of yourselves in my characters. Please don’t sue me for libel. You have been warned. What is your favorite passage/scene in DOVE ARISING? All of Phaet’s interactions with Wes, her rival and ally in Militia training, are so cute and awkward. Both of them are quiet social outliers with big secrets, so things get interesting when they start to work together. Wes is amazing at martial arts (ie hurting people), but he’s also great at saving them because he’s an accomplished doctor-in-training. When he offers to help train Phaet, she doesn’t know what to make of him, and it only gets worse after she starts finding him attractive. Like, Oh, there’s a cute guy running at me, but it’s to show me tough love by throwing punches. What’s a girl to do? Sigh. Their bonding scenes make me so happy. Mostly research about the moon itself: geography, geological properties, et cetera. Picking out locations for all six Lunar Bases was challenging but really fun, and so was constructing the scenes when the Militia trainees go off-Base. They encounter mountain ranges, meteorite bombardment, and tunnels beneath the Lunar surface carved out by ancient lava floes. I didn’t know about any of that when I started writing. Thank you, Google. I’m devouring Bitterblue by Kristin Cashore, and have Sabaa Tahir’s An Ember in the Ashes on my nightstand. That second book’s not coming out until April, but I was lucky enough to get an ARC. It looks so amazing! Eh, I sort of wrote about what I knew. I was seventeen when I drafted the book, so having a protagonist who was fifteen came naturally. Phaet became almost like my selectively mute and really smart little sister. Facebook. I got one in 7th grade and it’s been an excellent procrastination device ever since. Sun Wu Kong, a flying, talking monkey from Chinese folklore. Nobody messes with him and gets away with it, except maybe the Buddha. Firefly. Darn, I wish there had been more than one season. Give me a block of sugar and I can survive on that for a month. Even better if it contains chocolate. Probably heights. I hiked up Yellow Mountain in China at age 10. There were no guardrails near the top, the path was three feet wide, and rain made the path super slippery. I thought I was going to die. “OctaHate” by Ryn Weaver. Its sound is so unique and upbeat despite it being a breakup song. I just dance and don’t really listen to the words. I can’t wait to see Selma. So happy that MLK is getting some screen time! Thanks so much Karen for answering my questions! 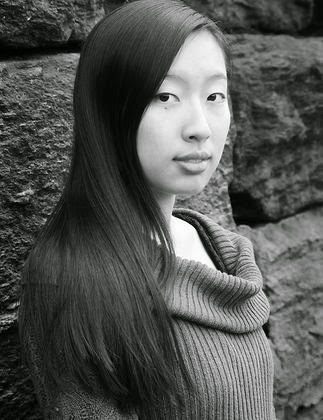 Karen Bao is a writer, musician, and aspiring ecologist. She's three years older than her brother and sixty years younger than her violin. Born in California and raised in New Jersey, she currently studies environmental biology at college in New York City. Karen began writing Dove Arising at the age of seventeen. 3 winners will receive a Dove Arising T-shirt and a finished copy of the book! US Only. a Rafflecopter giveaway Thanks to Penguin and Karen for the interview! Hi lovelies! I have been awaiting the arrival of this book for quite some time! The cover is what grabbed my attention first since there is something about the simplicity about that I i love. Once I read the any synopsis I was completely sold. I can't wait to read it. I love the cover! Your book sounds like an exciting read. I love the romantic tension! I enjoyed your interview and reading about your likes and more. Thanks for sharing and for the giveaway! This sounds fascinating. I do believe we will colonize the moon one day. I'd be first to sign up! Thanks for the interview. It's always fun to learn how an author writes her story and characters. And the personal stuff is fun too! I hope your tour is a great success and thanks for the giveaway. Great interview I also love Charly Weasley this book looks and sounds fantastic. Thanks for the awesome giveaway! Thanks for the interview! YAY for Charlie Weasley!!! This sounds interesting. Thank you for the giveaway. It's amazing how many people loved Firefly. I've never heard of that super hero. I have heard of this book though and it sounds really good! I have heard so many great things about this book! I cannot wait to read it! Thank you! This sounds like an interesting and different read! I love the cover!